La 8ème Conférence Internationale sur la Spectroscopie de Photoélectrons en Rayons X Durs (HAXPES 2019) se tiendra à Paris du 2 juin au 7 juin 2019. La conférence couvrira les sujets les plus récents et intéressants dans les matériaux quantiques, les sciences appliquées, la chimie, la physique atomique et moléculaire et la dynamique des électrons vues par HAXPES, ainsi que les dernières avancées technologiques dans le domaine. Le programme scientifique de HAXPES 2019 comprendra des présentations orales plénières, invitées et contribuées, ainsi que des séances d'affiches et des expositions de fournisseurs. For Participant, Plenary talk, Invited talk, Student and Organizing Committee: Registration include access to conference during five days, meals, Sunday cocktail and conference dinner. At nightfall, 58 Tour Eiffel changes ambiance. A hostess will welcome and accompany you to your table where the quietly elegant atmosphere wraps you in its warmth. Soft lighting and minimalist furnishings decorate the restaurant so as not to upstage the beauty of the City of Lights. PLEASE NOTE: Order forms are not accepted except for CEA and CNRS. Your registration will be definitive as soon as your payment will be received. A payment online is possible. You just have to select this mode of payment when registrating and to follow instructions. You will be informed about the selection results from the Programme Committee. Posters panels will be located in the “Patio” of Campus Pierre and Marie Curie. There will be a SFV student poster prizes of 500€ based on abstracts designated for this competition. Before the poster session, each student will be given 2 minutes in a Poster Blitz session to introduce their work. In both cases, you are requested to use ONLY the template below (Word or .Rtf file - Any abstract not in compliance with the template will be sent back to the author). The size of the files is limited to 4 Mo. 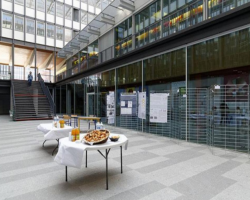 We are pleased to invite your company to participate in the 8th International conference on “Hard X-Ray Photoelectron Spectroscopy” (HAXPES 2019), which will be organized by the French synchrotron radiation facility and Sorbonne University, from 2 to 7 of June, at the ‘Campus Pierre and Marie Curie’. We do believe that HAXPES 2019 is indeed a very beneficial platform for your company. During the five days, your representatives will be in close contact with international scientific experts, in a stimulating environment, where you could introduce new products and developments, and build new relationships with potential customers. We would like to invite you to start planning your participation as an industrial exhibitor or sponsor. Different options are available, which are detailed below. If you wish to join us, please fill in and send in the registration form.For any further inquiries concerning exhibiting at and sponsoring HAXPES 2019, please contact Conf-HAXPES-2019@synchrotron-soleil.fr. Please note that the number of booths at the exhibition area is limited, and they will be attributed on a first come first served basis. This offer includes: 1 table (~1.60x0.80 m2), 2 chairs, power supply, one board for commercial posters, 2 attendances fee to the conference, your company logo and link on the conference website and in the Book of Abstracts. Please, note that there will be no paper copy of the book of abstracts, which will be delivered on a USB memory stick. 1ter. Registration to the Conference dinner at the restaurant 58 Tour Eiffel in Paris, 79,16 € excluding VAT (95,00 € including VAT) per person. 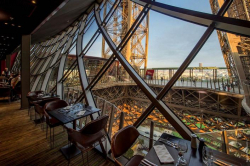 Your company can sponsor the conference dinner at the restaurant 58 Tour Eiffel in Paris, on Thursday 6, June 2019, minimum 833,33 € excluding VAT (1000 € including VAT). Your company can sponsor the best young speaker awards, minimum 416,66 € excluding VAT (500 € including VAT). This offer includes: commercial booth at the exhibition, two attendees for the commercial booth, two registrations for the conference dinner, your company logo and link on the conference website in the book of abstracts and on the conference bag. The meeting will take place Sunday 2nd to Friday 7th June, 2019, at Campus Pierre and Marie Curie in the amphitheater 15, close to the tower 15. The Campus Pierre and Marie Curie is located in the 5th arrondissement, the oldest in the city of Paris. Located on the left bank of Paris, it covers most of the magnificent Latin Quarter. 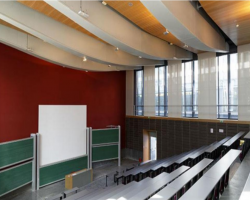 Many public institutions reside in this district: 'Ecole Normale Supérieure' (ENS), National School of Chemistry of Paris (ENSCP), the Currie Institute, the Ministry of Research or Sorbonne University which includes the Campus Pierre and Marie Curie. The 5th arrondissement is also full of monuments such as the Pantheon, La Sorbonne and famous gardens like the 'Jardin des Plantes de Paris'. Get off at the station ‘Saint-Michel-Notre-Dame’ and walk about 2 min towards Campus Pierre and Marie Curie. 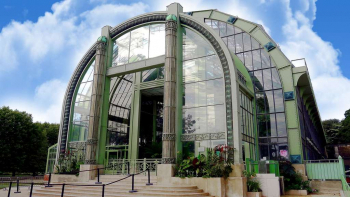 Get off at the station ‘Châtelet-Les Halles’ and take the subway 7 towards ‘Mairie d’Ivry’. Get off at the station ‘Jussieu’ walk about 16 min towards Campus Pierre and Marie Curie. Take the RER B towards : Robinson or Orsay, Massy or Saint-Rémy-les-Chevreuses. Get off at the station ‘Jussieu’ and walk about 2 min towards Campus Pierre and Marie Curie. Take the subway 7 towards ‘Mairie d’Ivry’ and get off at the station ‘Jussieu’ and walk about 2 min towards Campus Pierre and Marie Curie. Take the subway 10 towards : Boulogne/Pont de St Cloud. Take the subway 14 towards ‘Olympiades’ and get off at the station ‘Pyramides’. Take the subway 7 towards ‘Villejuif – Louis Aragon’ and get off at the station ‘Jussieu’ and walk about 3 min towards Campus Pierre and Marie Curie. Get off at the station ‘Jussieu’ walk about 2 min towards Campus Pierre and Marie Curie. Walk about 2 min towards Campus Pierre and Marie Curie.